Review of The Art of Pixar: 25th Anniv. : The Complete Color Scripts and Select Art from 25 Years of Animation by Amid Amidi features a collection of the complete color scripts of various Pixar films like Toy Story, A Bug’s Life, Up, Cars 2, and Toy Story 3. The book shows the evolution of Pixar as an animation studio throughout the years. Aside from the colored scripts for various animation films, there are also scripts for some animated shorts that are probably appearing in print pages for the first time. With more 300 pages of scripts, the readers will gain appreciation and may even try to do comparison of the various artists that made some of the most well-known animated films. In addition, it features the process that the images undergo before they are united to make meaningful pictures or scenes for a film. Though filled with color scripts that span numerous films, any kind of explanation for the pictures are lacking. 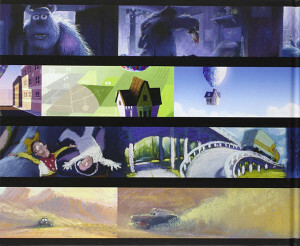 The Art of Pixar provides an insightful and inspiring look on what went behind the scenes in creating animation films. It is must have for animation and illustration fans and artist who will surely appreciate the contents of the book. Overall, it provides the readers a sneak-peek on the minds of the greatest artistic minds behind Pixar.